With the growing popularity of Apple’s iPad and iPad 2 tablets, different kinds of cases have been released in the markt. iPad use is no longer exclusive to grown-ups and in fact most people buy iPads for use by kids or babies. For those looking for good a good case for their iPad and iPad 2, therefore, it has been necessary to take the kids into consideration. Most iPad cases look great but only a few really focus on functionality, and even fewer offer truly effective protection. 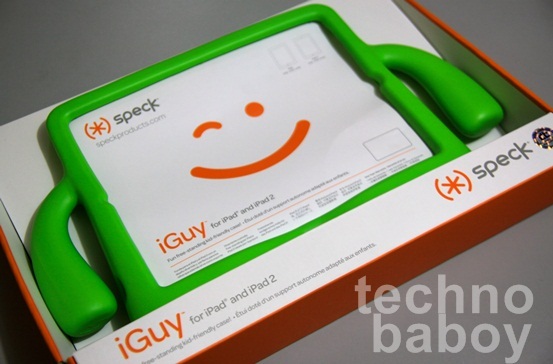 Now comes Speck’s iGuy case for iPad and iPad 2, a cute looking foam case that promises to offer total protection for the iPad and iPad 2 tablets from use by grown-ups and kids alike. 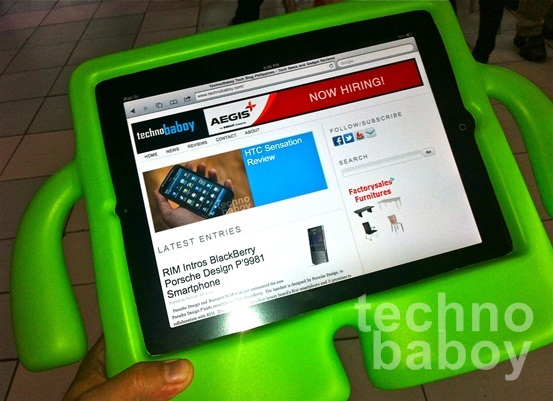 At an affordable price of P1,450, the iGuy easily becomes one of the best options for an iPad case. The iGuy is a weird-looking case, and actually looks like something that came from outer space. The iGuy assumes a human form, which somehow explains the name, complete with legs and arms and a space in the middle where the iPad or iPad 2 goes. The playful design will certainly appeal to babies and kids, especially with the available color choices of green, blue and orange. The iGuy maybe bright and playful but it is designed for ultimate protection and functionality. 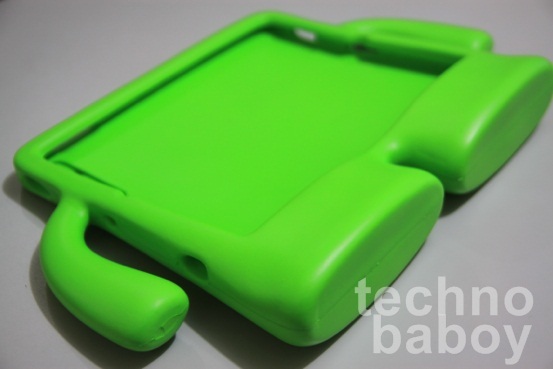 The iGuy case is made of soft, non-toxic EVA foam. It is very lightweight yet it feels really strong and sturdy. The arms of the iGuy are meant to function as handles and the legs allow the user to use the iPad in a standing position. How does the iGuy fare in actual use? The iGuy proves to be very useful in protecting the iPad or iPad 2 and is in fact more useful when you want to use the device in an upright position, like watching a movie or looking at photos in landscape mode. 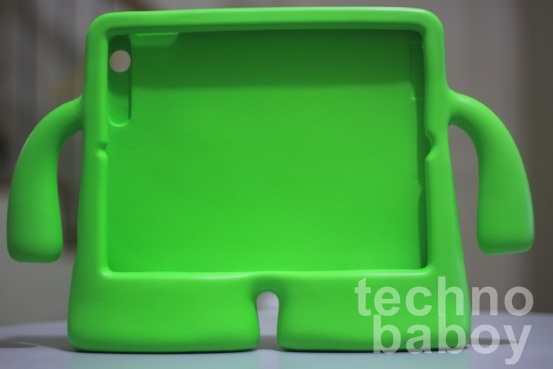 As a protective case, the iGuy keeps the iPad or iPad 2 very safe from bumps and even accidental drops. The case is sufficiently thick so it offers really good cushioning. The iGuy’s thickness is quite useful when the device is in the hands of a kid or a baby. There is also a raised screen bezel so you don’t have to worry about your device getting scratched when it is placed face down. 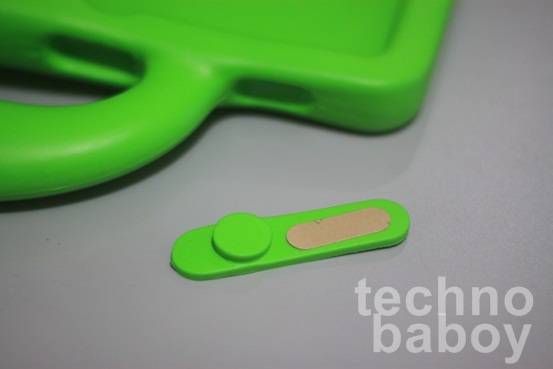 The material used on the iGuy is also surprisingly soft and squishy so the case is really comfortable to hold. The iGuy has all ports and buttons of the iPad and iPad 2 accounted for. However, since the two devices do not have the same ports and buttons and also do not have the same thickness, there are some imperfections when either device is used. For instance, when the original iPad is in iGuy, there are extra holes where the iPad 2’s camera and microphone are located. Thankfully, the iGuy comes with a camera plug so there’s one less hole to worry about when it’s the iPad that’s inside the iGuy. On the other hand, when the iPad 2 is on the iGuy, some holes just look bigger. The slot for the body of the tablet is also obviously designed for the thicker original iPad so when you slip in the iPad 2, there’s a little extra space, although it is not noticeable. In actual use in fact, the iPad 2 still feels very secure in the iGuy. Pressing the buttons on either the iPad or iPad 2 is not a problem as the holes offer just enough space but they are quite deeper than usual. something that in fact gives additional protection to the device as babies and kids will find it hard to access these buttons. Plugging in accessories is also not a problem on the iGuy as they go through the holes easily. The iGuy’s feet offer steady support to the iPad and iPad 2 when it is set down. It stands nicely especially on a flat surface. Hence, watching videos and photos on the iGuy is a pleasant experience and saves you energy otherwise spent on holding the device. On a rough and uneven surface like a bed, the iGuy can be a little unsteady but there’s really nothing to worry about even if it falls since it is sufficiently padded and cushioned. Holding the iGuy by one of its hands can be a problem as the arms are too flexible and don’t offer enough support when used individually. It’s a different story, however, if you hold both hands of the iGuy. Considering the soft foam material used on the iGuy, expect some creases to form on the head of the handles after long use. Buy don’t worry since the creases will not cause the hands to separate form the iGuy’s body. The hands are fairly sturdy and will require some superhuman force to separate them from the body. The design of the iGuy is not for everyone and is certainly not meant to be brought everywhere. For instance, I do not see myself bringing it to a business meeting. Still, it’s design is fun and unique and I see it being apt for a lot of situations. If you are looking for something that will give your iPad or iPad 2 some character, the iGuy is definitely worth considering. And if you have babies or kids and you want them to use your tablet for educational purposes or for playing games, the iGuy becomes a necessary accessory if you want to keep your device protected. There’s also nothing to worry about in terms of possible health risks to your kids as the iGuy is made of non-toxic foam material.